I bought a cheap pair of shoes yesterday. Retail therapy I guess you could call it. I’m not sure I agree with the placement of the lower strap, but they didn’t have the one I wanted in my size, so I wound up with these. Which is exactly what you shouldn’t do when shopping — settle, just because you’re broke and a bit down. I imagine I’ll wear these in inclement weather as the cheaper leather looks like it can take it and the “leather sole” is sort of suspect in my book. Still, for less than USD$70, I can’t complain too much. Especially since I have yet to spend a day walking around in them. For two hundred and some more, the best bet going is the Allen Edmonds Neumora. On sale now. Just a word to the wise. This entry was posted in Uncategorized and tagged Allen Edmonds, Double Monk Straps, DSW, Neumora, Steve MAdden. Bookmark the permalink. 4 Responses to Retail Therapy. 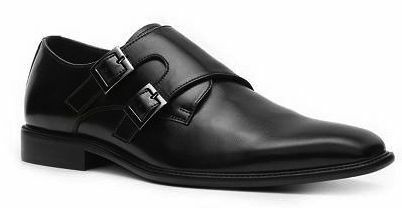 Chris, I don’t appreciated monk strap shoes the way many men do, but Allen Edmonds is a different story. You will not find a better American made shoe than AE. I own thirteen pairs and will buy another pair during this current sale. You will never be disappointed with anything they make, whether it is a pair of shoes or a belt. They are a fantastic company. I understand though, all too well, the concept of retail therapy. It always makes me feel better. Instead should have just bought a pair of socks. Yes, David. But the buckles on the socks are terribly uncomfortable. As a woman who has spent way too much (I am embarrassed) on shoes I can tell you the truth about shoes. Those shoes just disappear into the floor (in my opinion; that is as it should be. No one is counting the straps.) it just isn’t important. That being said; I actually saw my own godfather for the first time in 10 years (critical 10 years…..11 to 21 and I worshiped him!) and I was so focused on his black espadrilles and his “Lilly” pants in Florida; that I did not look at his face for two hours! Then we had a “rollicking reunion”!! (I grew up in California, where he lived) I had never been to Florida! No wonder I ended up as a decorator! There you go! Shoes make the man. “Belgian Shoes” REALLY make the man. Soft soles. Swoon!